The Eutech Alpha pH 1000 controller/transmitter delivers a wonderful combination of sophisticated control functions along with consistent performance and accuracy. Seven preset buffer values offer quick and accurate auto-calibration. An additional electrode offset function enables direct reading corrections without any requirement to remove the electrode from the control system. If finer more precise control is required the Alpha pH 1000 offers proportional pulse length control along with proportional pulse frequency control, in addition to basic limit control. There are a variety of modes this meter can be set too to enhance the use for the user: symmetrical mode for clear, uninterrupted pH readings in electronically noisy environments. Antimony mode, which gives the user to option to use antimony electrodes in applications that involve corrosive hydrofluroic acid. There is in addition the option for the temperature compensation to be set to either auto or manual and the three wire system compensates for cable length resistance errors. Galvanically isolated scaleable to 0/4 to 20 mA output for high quality output on peripheral devices. 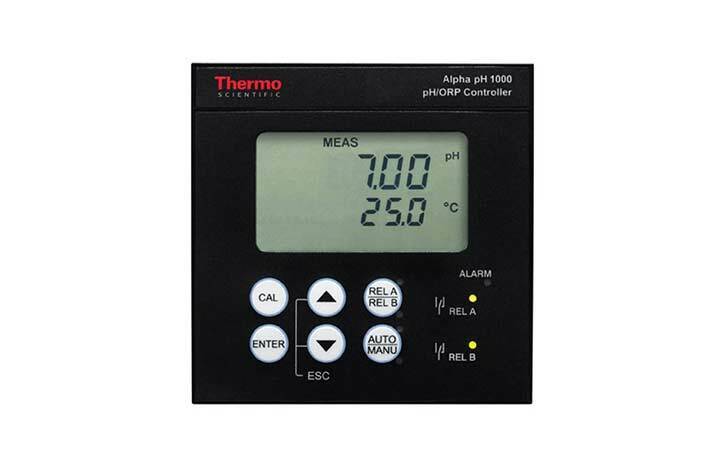 A standard of the Alpha pH 1000 controller/transmitter is the 1000 limit/proportional controller which offers two additional features: wash function for scheduled electrode wash and alarm relay function which handily alerts when measurements cross the set points. This device is covered by a 1 year warranty.